James Broderick Design Blog: FMP 1 - First Steps! Well new year, new project. This is it now, our last project at DMU. I am working with Amber Jamieson and Hazrat Bilal on a vertical slice of a potential game, based around the concept of using a fire character and a water character together to complete puzzles. Our first goal is to create a playable prototype by creating the game mechanics using UE4's blueprints, this will be mine and Hazrat's job for the first month or so. Quite some time ago now we tried to come up with concepts for our FMP, to see what wacky or weird ideas we could come up with, the main guide though is that is must be interesting and not something which would have been seen a lot as a project theme. 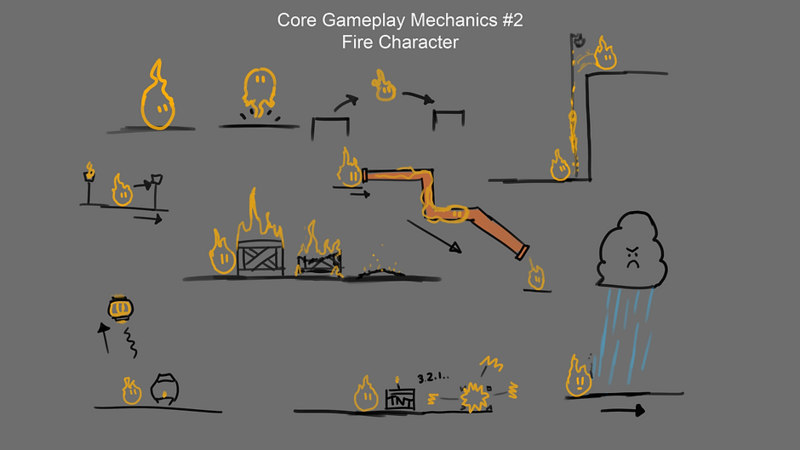 An idea I come with was a simple puzzle game that would put the player in control of a little flame character, where you would have to avoid getting put out by rain. This was later expanded into a fire and water character in which the interactions between the two and the environment would be the focus of the gameplay, this approach gave us a lot more flexibility on where we could take the concept. Another aspect we wanted to include was narrative, the gameplay decisions we made gradually lent itself to a natural narrative which included an NPC character called Olive, who the fire and water character guide through the world as her guardians. Our plan for FMP is to create a small vertical slice of the full game, so just one small level that will introduce the concept to potential backers. This will be highly polished and only show one or two central mechanics aswell as basics of any art direction, narrative and any other important factors that show what the full game could be. 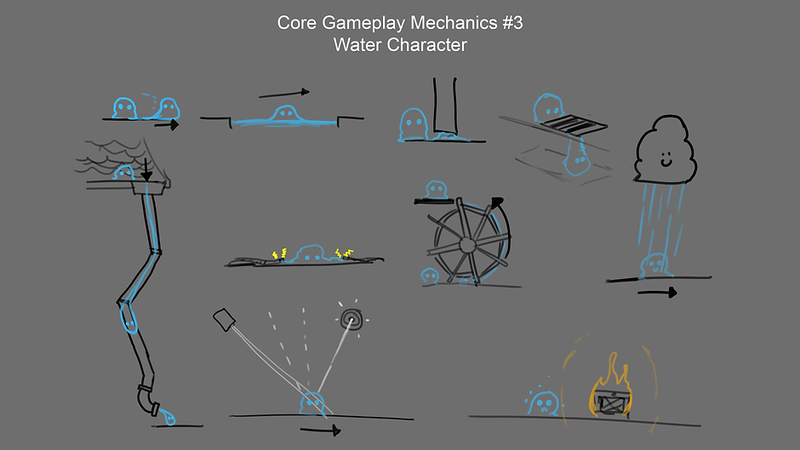 Our mechanics are quite simple and are designed to interact with each other, something we come up with was the idea of that the fire guy's movements usually focuses on upwards movement because of the lack of weight where the water guy usually falls through gaps and can't jump, but has weight allowing him to push objects and tip scales. Come back next week where I will run through how we implemented some of the basic mechanics inside UE4!